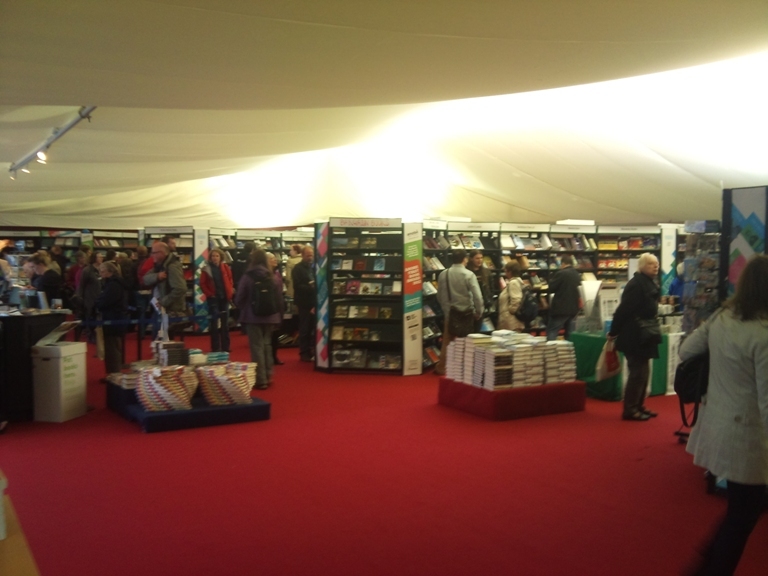 Great books, great talks, great atmosphere and (occasionally) great weather – the Edinburgh International Book Festival has been an annual pilgrimage that I have made since I was first taken there by my Aunt when I was a child. In August each year, Edinburgh plays host to a variety of different festivals. The most famous being the Edinburgh Fringe, which showcases comedy, theatre, music and dance. 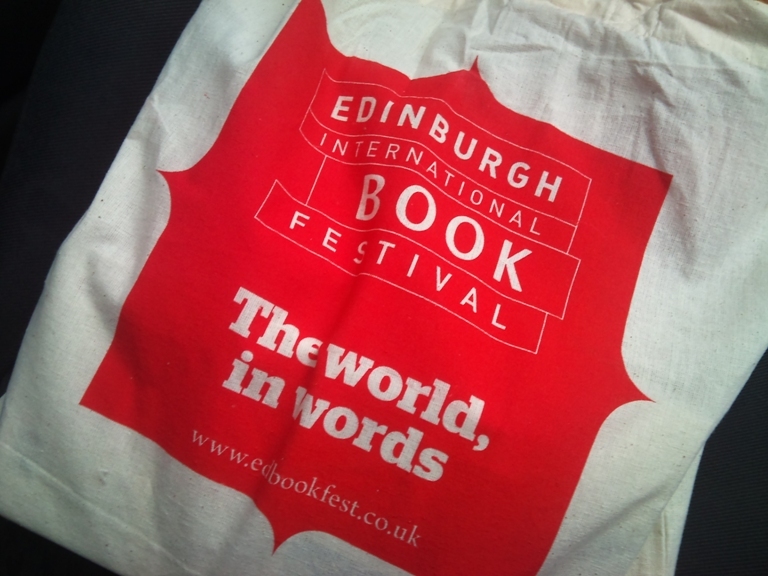 But while the buzz of the Fringe is going on, just one minute’s walk from Edinburgh’s main thoroughfare, Princes Street, there is the less frenetic – but equally enticing –Edinburgh International Book Festival. Unfortunately this year I wasn’t available to attend many of the Book Festival’s events, which is a particular shame as many of the talks and guests have been particularly superb, judging by the guide available online. However, I did find that I had Monday free, which also happened to be the last day of the Book Festival, so I popped along to soak up the atmosphere. In typical Scottish style, the weather was wet (and I had chosen to leave the house in shorts and T-shirt – but the least said about my wardrobe choices, the better!) So on arrival at Charlotte Square Gardens, I was soaked through. It is not particularly easy to find parking around the location, so it is always best to arrive by public transport if possible. Nevertheless, the moment I entered the tented foyer of the complex, the friendly staff at the door were ever-welcoming and I soon forgot about my rather damp appearance! There were quite a few talks on today that were already sold out. The popular three-part debate on ‘Rethinking the Union’ had been sold out for a while, and although I would have been otherwise interested in attending, I really wasn’t in the mood for a political discussion that day. However, I do have a deep interest in languages, and work occasionally doing freelance translation, so the talk ‘Gained in Translation: How the best Translators Do It’ leapt out at me. I booked my tickets, and then went for a quick coffee before the talk. The talk itself was held within the grounds at the RBS Corner Theatre; a large and comfortably kitted-out tent, with a stage and seating for at least 100+ people. Chaired by Marion Bourbouze, the Head of Marketing for the Scottish Book Trust, its speakers were the delightful Sarah Ardizzone and Daniel Hahn, both respected literary translators, into English, from a diverse range of European languages. The talk examined the abilities necessary to be a ‘good’ translator, particularly now that the job has become more professionalised over recent years. An interesting discussion resulted between the two translators on their experiences of the job: the serendipitous events that lead to their becoming translators, the necessity of inhabiting the original author’s voice, but also tempering that with your own voice and the nuances required of your mother tongue. The overall emphasis was that being a good linguist is not necessarily the most important quality needed to be an effective translator. After an excellent discussion that lasted an hour, the discussion was opened up to the floor. One rather overly-enthusiastic (yet equally over-arrogant) audience member did create a bit of a stir by hogging the microphone initially (nope, not me!). However, he was soon heckled by the back of the room after being rude to the staff when pressed for his ‘point’. Nevertheless, the remainder of the floor’s questions were extremely insightful and thought-provoking. Mulling this talk over, I decided it was time for some retail therapy and to get my wallet out and buy some books. So I headed over to the Festival’s bookshop – a lovely huge expanse of bookshelves, with the visual delight of pristine literature on offer intermixed with the smell of coffee and the sound of clinking crockery from the café at the back. The choice of books on offer was huge! I browsed for over an hour, making notes with my phone on which books I should add to my Amazon Wishlist, but also picking up three books that I had to take home with me there and then. 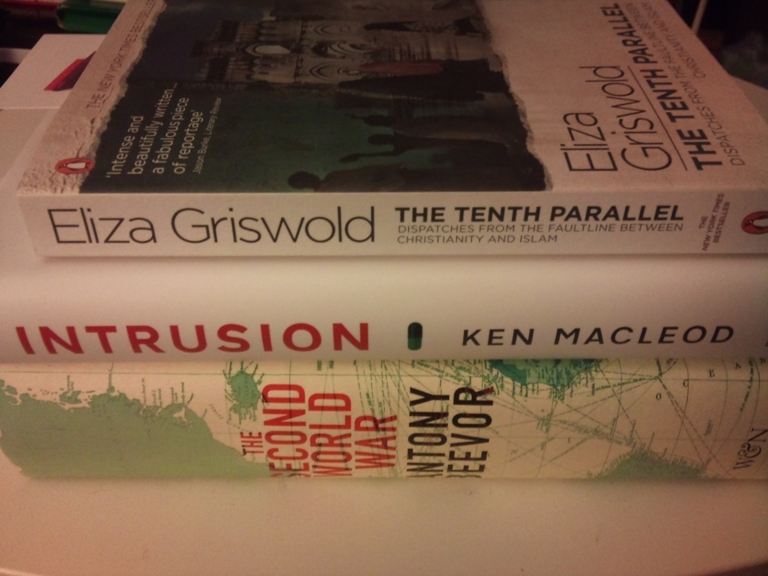 All three were impulse buys, and I’ve just started to dip into Beevor’s book tonight. 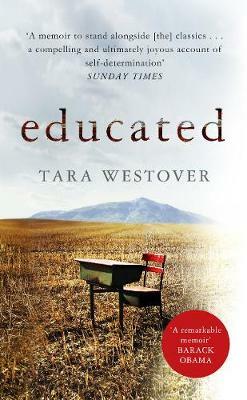 From what I’ve read so far, it looks like it will be another interesting read. Generally speaking I am not one for war books, but European history is of huge interest to me, and this seemed quite broad in its coverage without being interminably dry. MacLeod was also a speaker at the Book Festival, and having read a recent interview with him I was interested in checking out his work – a dystopian vision of the future akin to Orwell’s Nineteen Eighty Four and Huxley’s Brave New World – so his latest book was an immediate and definite choice for me. Finally, the Tenth Parallel feeds my political/religious curiosities. Griswold’s offering looks at the interplay between Muslim and Christian identities along the tenth parallel – the line of latitude seven hundred miles from the equator which bisects a range of countries through which ideological and political struggles between Islam and Christianity play out. So these three are now happily adorning my bedside cabinet, and will be devoured no doubt over the next week! 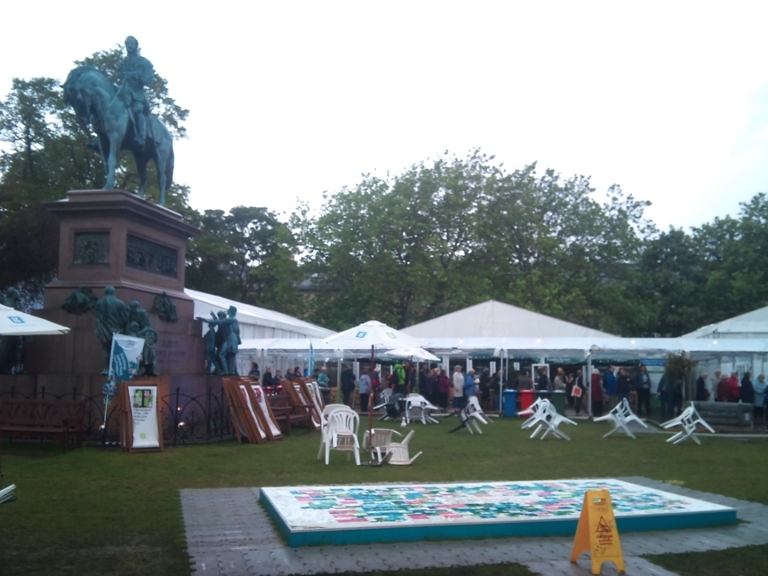 So all in all, my day at the Edinburgh International Book Festival was thoroughly enjoyable and the whole event looks like it has been a roaring success once more. 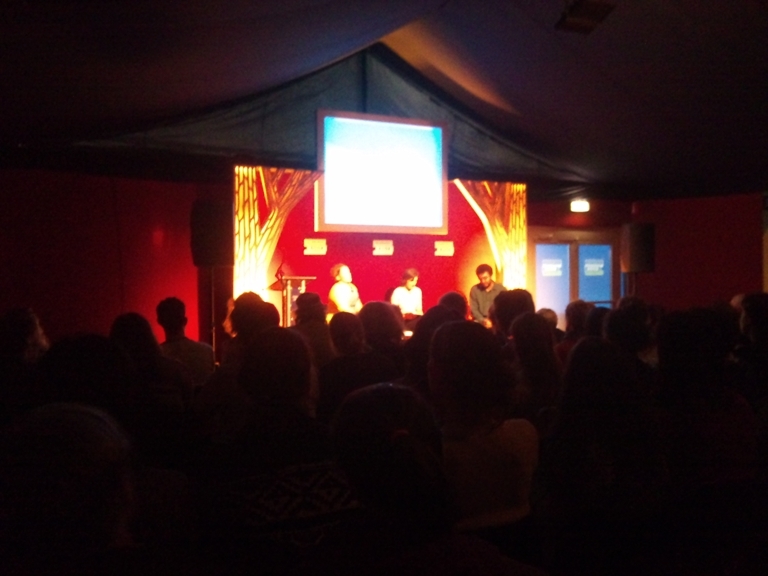 I really am looking forward to the 2013 Edinburgh International Book Festival! A huge thank you to my lovely friend AJ, who you can follow on twitter here @AlainnJJ, and who is in the process of setting up his own blog at the moment which I will tell you all about when it is complete. I have to say I am very envious of anyone who has been this year, maybe next year… ooh there is me hinting again, ha! Did any of you go?